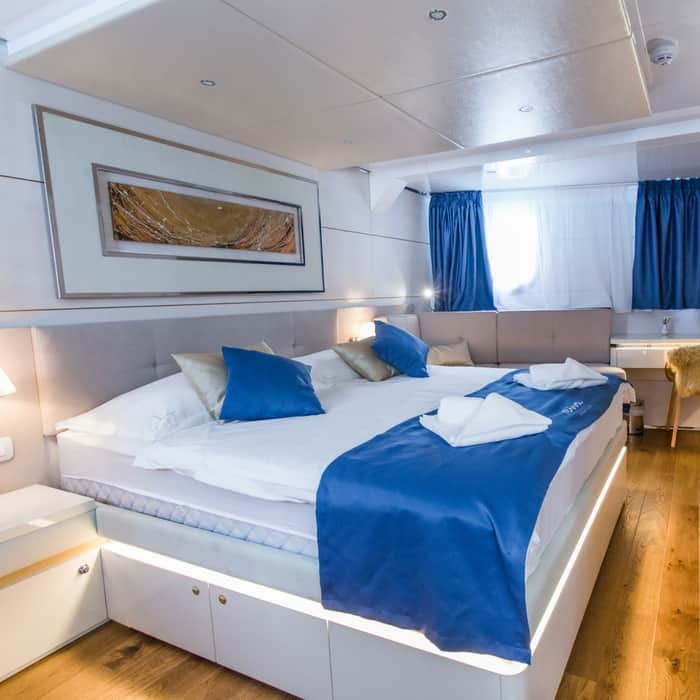 Cruise Croatia in refined style and exceptional comfort aboard the deluxe MV Riva cruise ship. The brand new addition to the fleet boasts elegant modern décor, state-of-the-art technology and luxurious recreational amenities. The 19 twin or double cabins offer spacious relaxation for up to 38 guests arranged over three deck levels. 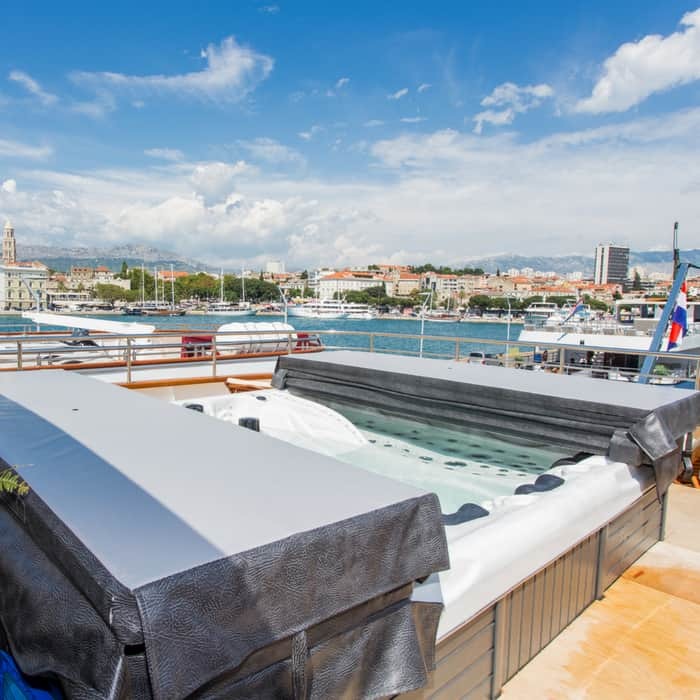 All cabins are en-suite and are beautifully appointed for your personalised satisfaction and enjoyment.While sailing to your destination you can relax in the hydro-massage pool or on the sun deck. VIP accommodation is situated on the upper sun deck, where you can enjoy an unforgettable first-class travel experience. MV Riva deluxe cruise ship is a 48,17m (157 ft) long, 8.6m (28 ft) wide deluxe ship, with a cruising speed of nine nautical miles per hour. The ship will have its maiden voyage in 2018 featuring the latest state-of-the-art equipment and amenities. The ship has a maximum capacity of 38 passengers in 19 twin or double cabins, ensuring exceptional personal service. The ships main deck features a spacious air-conditioned dining room with bar area which features an LCD TV, a corner buffet breakfast table and outdoor covered lounge area. 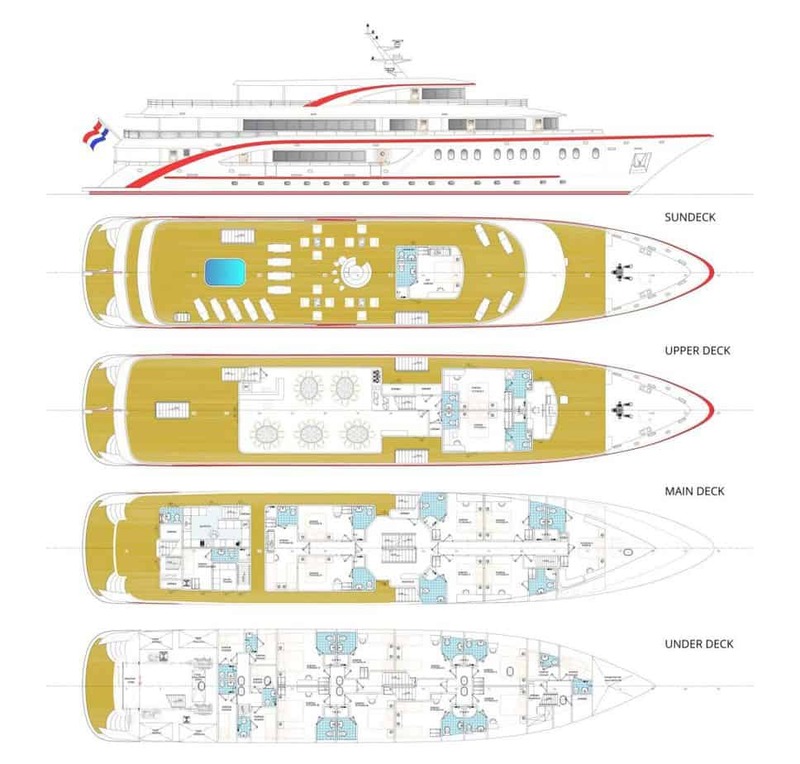 The ship features 19 modern air-conditioned cabins with one VIP cabin on the sun deck level, two cabins on the top deck, eight cabins on the main deck and eight cabins on the lower deck, each measuring approximately 13 to 15m2. All cabins are fully equipped and include a safety deposit box, fire alarm, emergency lights and internal communication for announcements by the Cruise Director or Captain. In addition, each cabin has life jackets, desk and tabouret, wardrobe, night stand, small sofa and a window (main) or port hole (lower deck). The bathrooms on board the ship are fitted with a toilet, shower, sink and hair dryer. 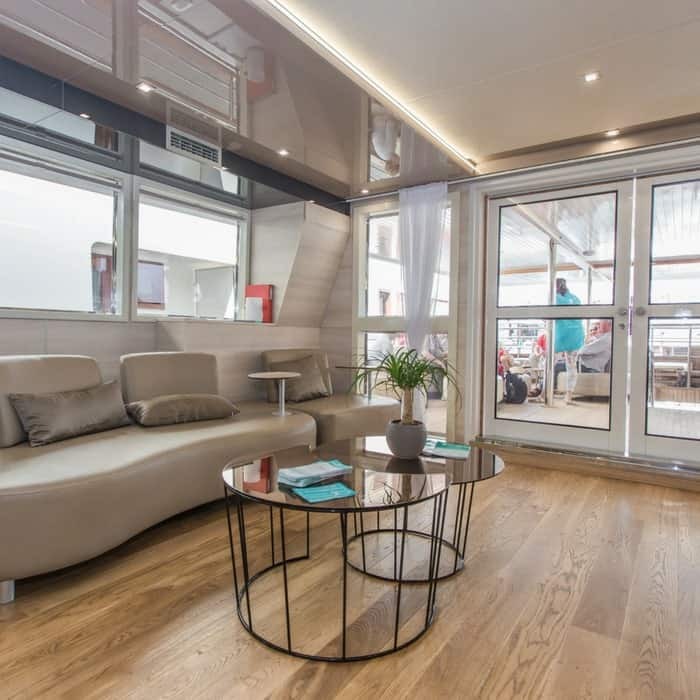 The MV Riva offers plenty of indoor and outdoor space for guests to enjoy with a spacious restaurant and bar area on the main deck with LCD TV, accompanied by a covered outdoor lounge area with sofas. The upper deck is perfect for sunbathing with plenty of sun-loungers for all passengers, a shaded area and a Jacuzzi. . The ship has a rear platform with ladders for easy access to a dip in the sea. A further two outdoor showers and two deck toilets are also available. Free WIFI is available on board the ship. MV Riva cruise guests enjoy half board meals; a daily buffet breakfast, six set lunches with four courses, complimentary fresh fruit and 1.5l of bottled water per passenger daily. This cruise also includes three evening meals on board. 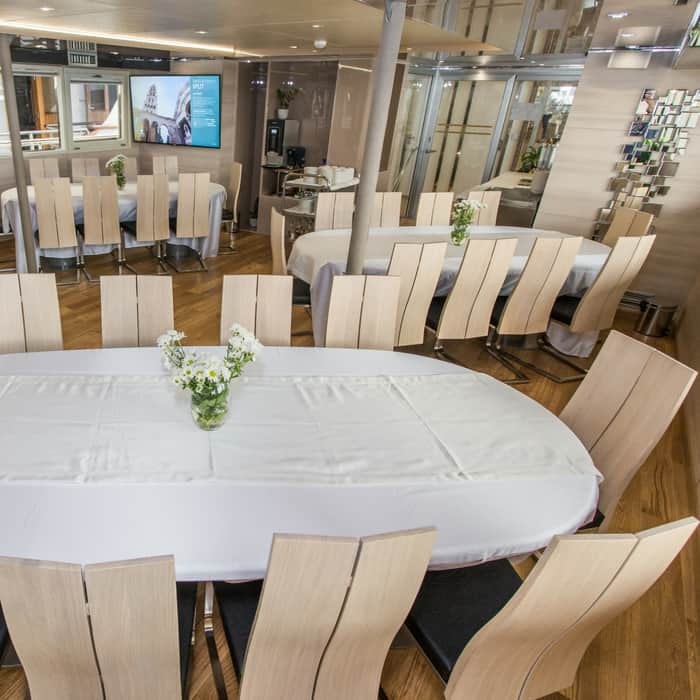 Dining on board the MV Riva is in a relaxed and informal setting, with no formal dress code. The on board bar offers a selection of wines, beers, spirits and soft drinks which are available to purchase and are payable at the end of your cruise.